Free from sugar. Suitable for vegetarians. Food Supplement Triple Action - Vitamin C, D & Zinc Immune Support* Redoxon® Triple Action is a combination of high strength Vitamin C, D and Zinc to help keep your immune system - your body's natural protector - on top form. When you have a busy lifestyle and you need to be at your best, some occasional support is always helpful. Vitamin C *Vitamin C is an essential nutrient that, among other things, helps to support our immune system. Vitamin D Vitamin D is primarily formed through the action of UV sunlight on the skin and helps to support the immune system. Getting your daily dose of sunlight is not always possible. Top up your Vitamin D with Redoxon® Triple Action. 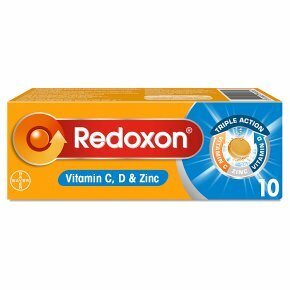 Redoxon contains the daily government recommended intake of Vitamin D (10 micrograms). Zinc Zinc helps maintain your skin - the body's first life of defence. *Zinc is a mineral which helps to support your immune system as well as an antioxidant which contributes to the protection of cells from oxidative stress. It has a wide range of functions in the body, including contributing to the maintenance of bones, normal hair, nails and skin. How to use Redoxon® Triple Action? Adults and children over 12: Dissolve 1 tablet per day in a glass of water to make a refreshing orange drink. Food supplements should not be used as a substitute for a varied diet or healthy lifestyle.<br>Do not exceed the recommended daily dose of 1 tablet per day.<br>Not recommended if you are pregnant or breast feeding; consult a healthcare professional before use.<br>This product is not suitable for people with iron absorption problems, kidney problems or raised calcium blood levels.<br><br>Keep out of sight and reach of young children.